Pocket strategies can come in handy when you’re in a situation like Misfits, who in yesterday’s TaKeOver 2 matches needed a win against Hammers Esports. When the Misfits came out of the Hollywood spawn on offense with a wall of shields and explosives, it certainly caught Hammers by surprise. 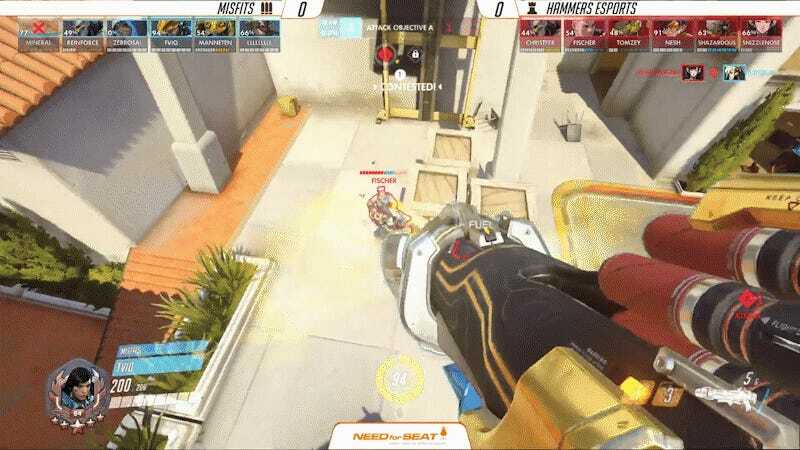 Sometimes referred to as a “spam” composition, the team composition relies on a steadily advancing wall of shields to protect its main damage dealers in Pharah and Junkrat, who lob constant projectiles through the wall. Two tanks, two healers and two spammers in tow, Misfits steadily rolled up the hill and onto the point. One devastating Pharah ultimate later, Misfits secured the game 4-3 and took a much-needed win. That victory was short-lived, though, as Hammers ran it back three games in a row to take the series. Games at TaKeOver 2 continue throughout today and tomorrow in Krefeld, Germany, and you can catch the action on TaKeTV’s Twitch channel.